In a less than two days, many of you will be gathering with friends and family to celebrate in a day of Thanksgiving. Whether you, my friends, celebrate this day on the last Thursday of November or in October (my Canadian friends), or in other countries just gathering with family and friends, it’s always a nice gesture to show up with a gift of gratitude. I’m talking about if you’re fortunate to be the guests and not the host family. For many years my extended family all lived within a few miles of each other and we gathered as a family with each of us entering grandma’s home with food in hand. But as my children and brother have moved away, they find themselves being guests and many times not being assigned any food dishes. Not wanting to enter empty handed here are some ideas I’ve shared with them to share their gratitude. Purchase a nice bowl, I like to stay with white or pewter because they will match everything, then fill it with some fresh fruit. 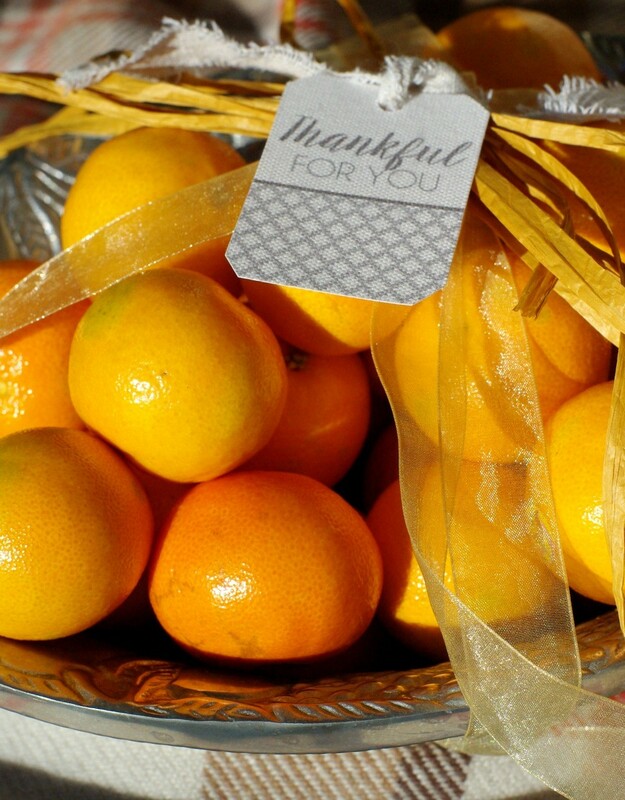 Clementines are always a great option and will stay fresh for a good week. 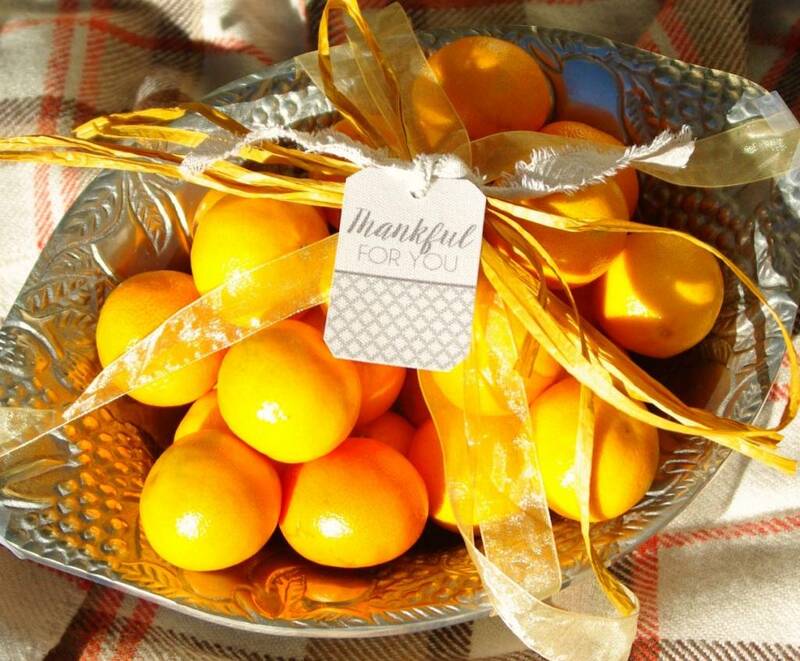 You could easily leave these without wrapping or simply tie on a ribbon with a homemade card. 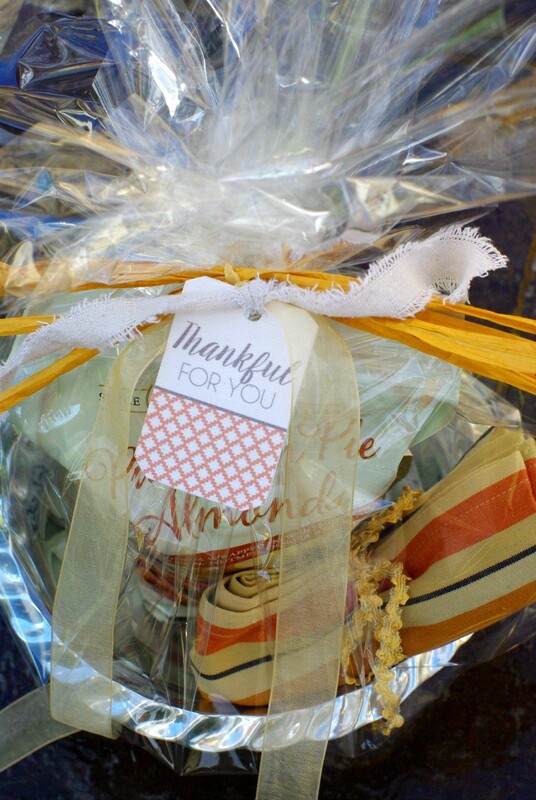 Purchase a Thanksgiving platter which the hostess can use year after year. Hand it over with a homemade tag . 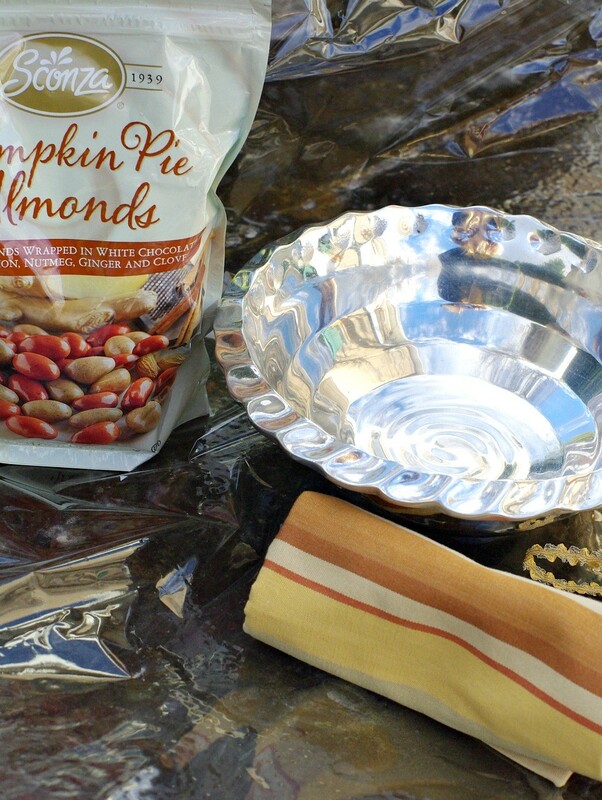 Buy a bag of treats which go along with the holiday (I found these yummy almonds at Costco), a candy dish (again I would stay with pewter or white) and maybe throw in a dish towel and then tie it all together with cellophane and your homemade tag. 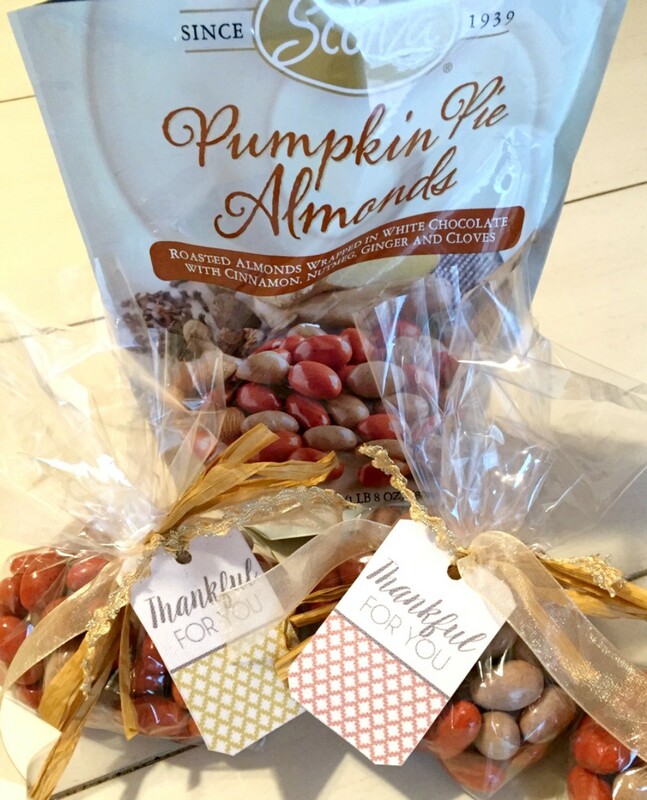 Or make individual treat bags for all to enjoy. You could grab a fresh bunch at your local grocery store and put them in a mason jar with a fun bow. You could also add a fun holiday wood sign which will last year to year. 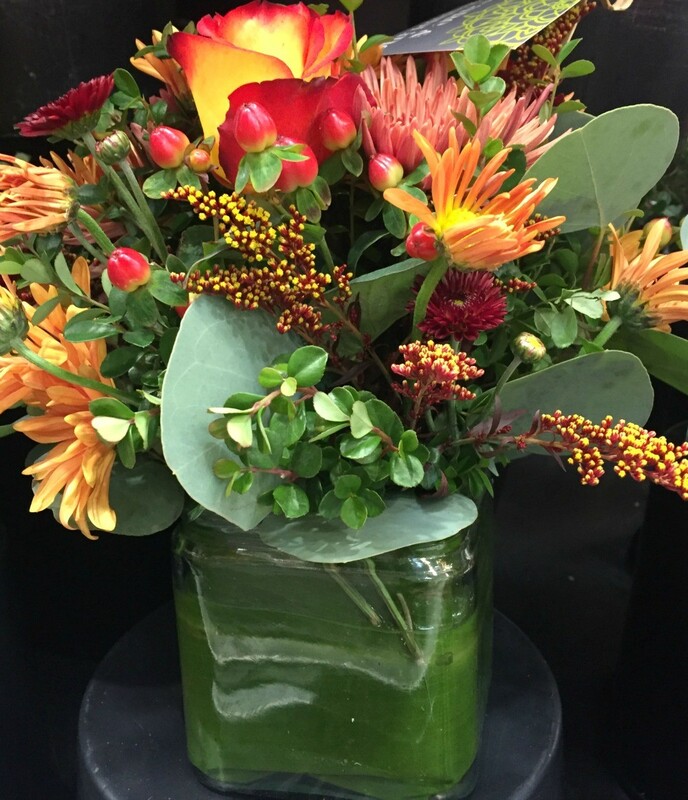 And if time is running out, simply stop by a local florist or grocery store and buy a floral arrangement. 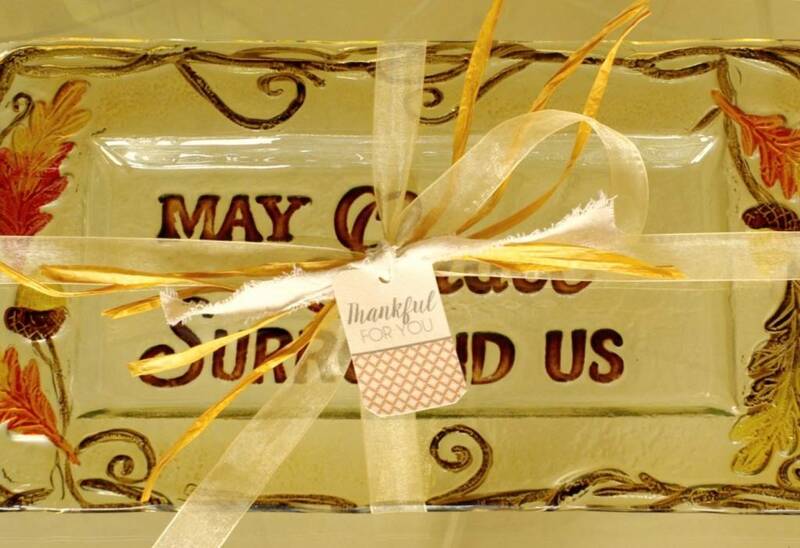 Wether you’re the guests or the hostess may you all have a day of Thankful hearts and gratitude for all around you. *homemade tags are easy to make, I downloaded these from the crafted sparrow here. In the summer I love to arrive with fresh flowers and a simple wooden fruit bowl brimming with ripe Pears, tied with a chartreuse organza ribbon. Beautiful. 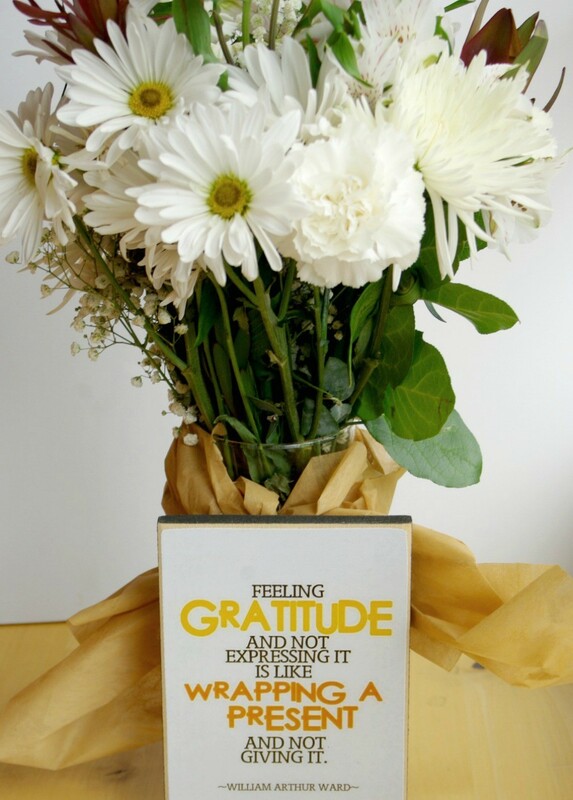 I love the saying “feeling gratitude and not expressing it, is like wrapping a present and not giving it”. Very well put. I also love the saying that Greetje quoted. 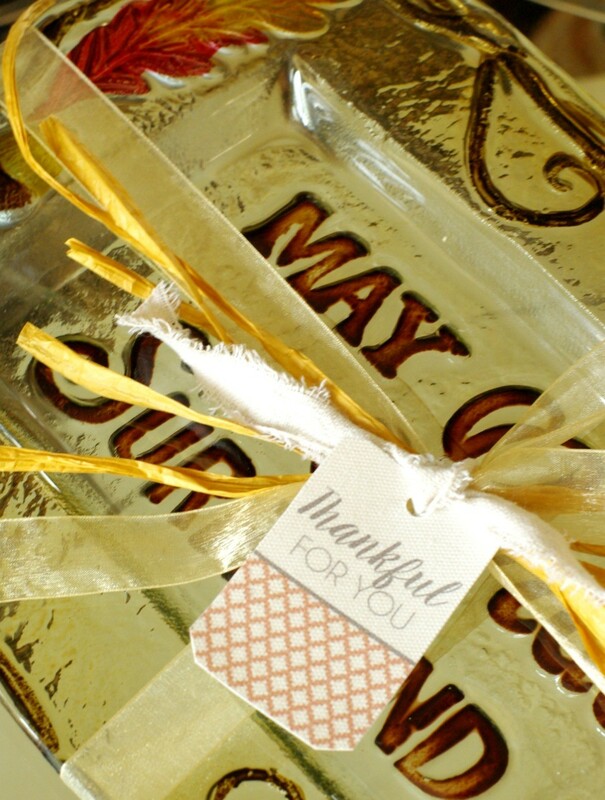 I adore these creative hostess gifts. I am bring wine this year, but perhaps I will make a homemade card! AS always, am inspired. have a wonderful holiday. so much to be thank full for!